The following is an index to property transfer deeds, party wall agreements, building restriction agreements, and easements recorded at the Suffolk County Deed Registry with respect to the original Harvard Club property at 374 Commonwealth, from the original land purchase until December 31, 2010. Mortgages, trust agreements, and other similar recorded documents are not included. This index is intended as a guide only; actual deeds should be reviewed for details. The original lot on which 374 Commonwealth was built was purchased by the Harvard Club on August 14, 1912, from the estate of Henry Lee. 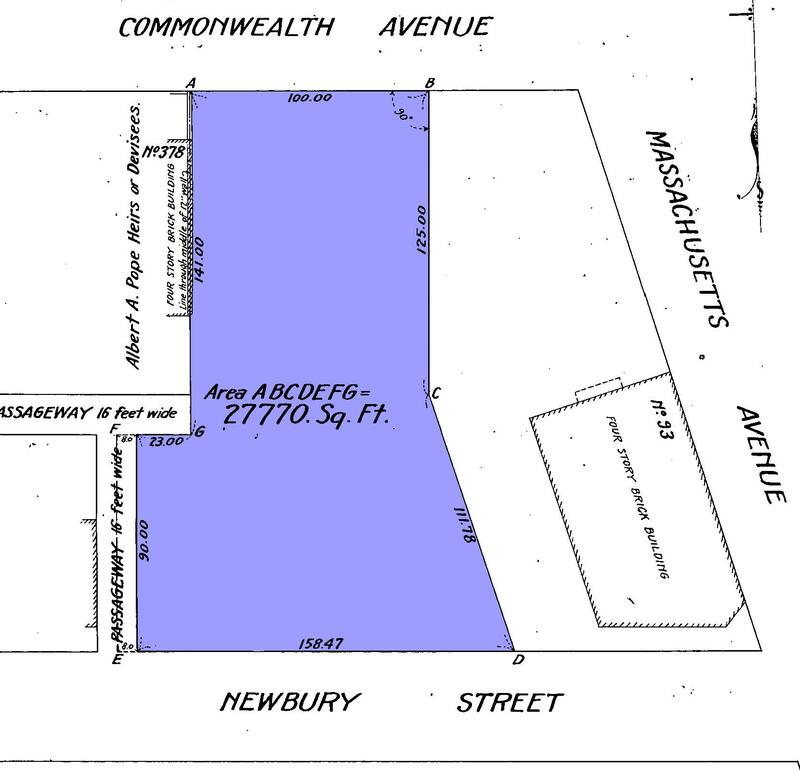 The lot had a 100 foot frontage on Commonwealth and a 158.47 foot frontage on Newbury. The lot acquired by the Harvard Club was shown on a plan by Aspinwall & Lincoln dated February 26, 1912. 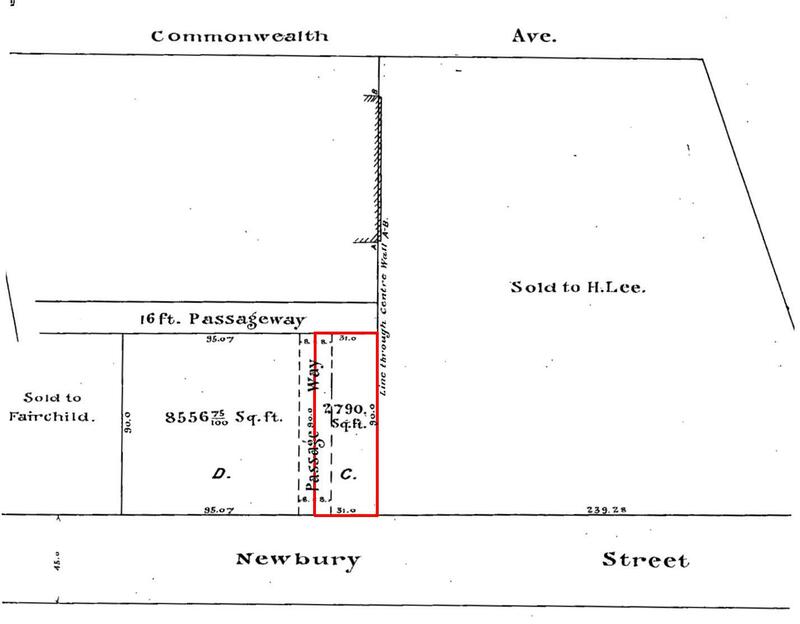 The lot purchased by the Harvard Club was part of a larger parcel which extended to Massachusetts Avenue (called West Chester Park at that time) between Commonwealth and Newbury, including the property where the Sherman Building was built at 93-97 Massachusetts Avenue in 1906 and where The Eliot would be built at 370 Commonwealth in 1925. Henry Lee had assembled this parcel through a series of transactions. Henry Lee acquired the bulk of the land in two transactions on December 9, 1886, combining portions of two larger tracts of land originally purchased from the Boston Water Power Company. The lots acquired by Henry Lee were shown on a plan by Fuller & Whitney dated October 15, 1886. 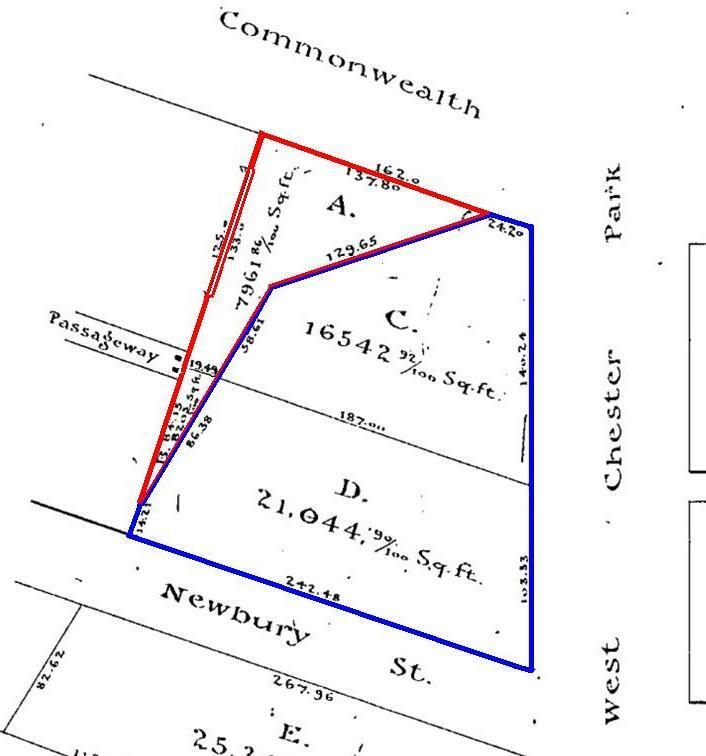 The eastern parcel acquired by Henry Lee was shown as Lots C and D on the Fuller & Whitney plan dated October 15, 1886 (see above, outlined in blue). These were part of two larger tracts that ran southwest from Commonwealth at approximately a 45 degree angle, spanning Massachusetts Avenue, that had been bought from the Boston Water Power Company on April 19, 1870, by David Nelson Skillings, as trustee for a group of investors that included himself, Lawrence Barnes, Charles Whitney, and David Whitney, Jr. These parcels were shown on a plan by J. F. Fuller dated April 19, 1870 (outlined in blue on the plan to the left). This land included Parker Street, which ran above the Cross Dam, and which ceased to be a street and was sold for development in 1878 (David Skillings bought the portion of the roadway that was within his other lands on February 7, 1878). 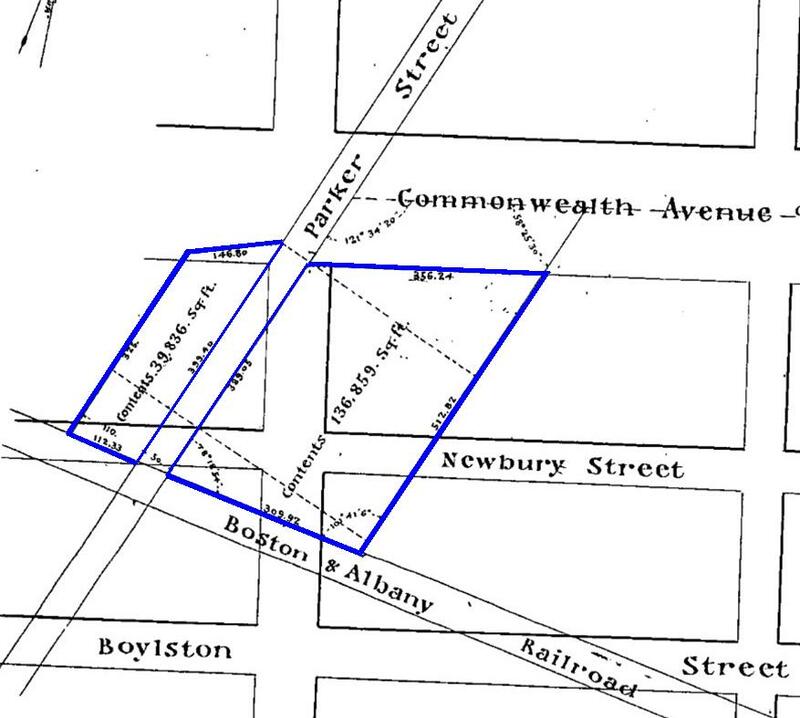 On July 1, 1896, Henry Lee acquired a third lot, with a 23 foot frontage on Newbury between the west border of the land he already owned and a passageway running north-south from Newbury (today’s Alley 917), connecting with a second passageway running east-west between Newbury and Commonwealth (today’s Alley 918). 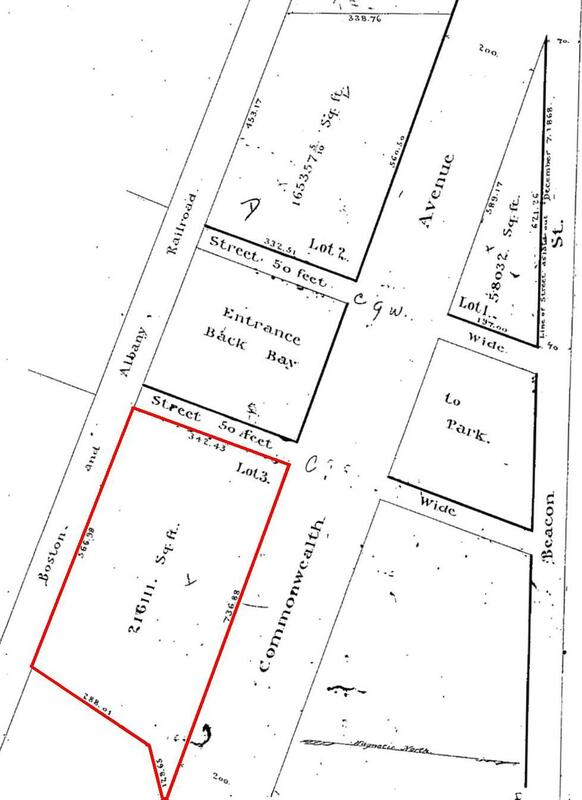 This lot was shown as Lot C on a plan by William H. Whitney dated February 25, 1889 (outlined in red on the plan to the right). The lot had been part of the same parcel originally purchased from the Boston Water Power Company by The Park Entrance Land Trust, shown as Lot 3 on the Fuller & Whitney plan dated June 26, 1880 (see above). The land on which 374 Commonwealth was built also was subject to party wall and building restriction agreements, and easements. After 374 Commonwealth was completed, the Harvard Club acquired additional property on Commonwealth Avenue and on Newbury Street. On Commonwealth, it acquired 398 and 400 Commonwealth in the 1920s, which it merged with 374 Commonwealth. In August of 2014, it subdivided 374 Commonwealth and 378-380 Commonwealth into two properties and converted 378-380 Commonwealth into condominiums. See 378-380 Commonwealth for indices to the deeds for this property. On Newbury, it acquired 399-415 Newbury between 1927 and 1965, razing the buildings and using the area for expanded parking. The deeds by which the Harvard Club acquired these properties (but not the predecessor deeds) are included in the index below.